This isn’t a normal blog post for me – it’s more designed for someone Googling how to replace fuel spill / leak off pipes on a Vauxhall Zafira A DTI. When I was looking for a guide there wasn’t really one to hand, so I thought I’d write one up for someone else needing to do it. If you’re not interested then just close the window now – it’s pretty dull! I’m not entirely sure what these pipes do – I believe they take excess fuel away from the head, and it’s recirculated around the fuel pump. The original pipes are rubber and can split, tear or leak over time, and the plastic t-junctions can become brittle and leaky. Mine have been dodgy for ages, and there’s a slight diesel smell in the car when sat in traffic as it leaks out. After doing a service on the car I decided to get the pipes changed, and – it’s really quite easy! First off, take the car for a spin, get it warm – the rubber pipes are easier to manipulate when they are warm. Get the bonnet open take the engine cover off – You’ll need a Torx T40 (I think – or T30) to remove the screws. Once it’s off you’ll see something like this. Now you need to unclip the water hose (the thick black one across the middle of the picture) no need to disconnect it, having it loose and out of the way is fine. Then you need to undo the plastic housing that the tube sits in – undo the two Torx screws (this is the set I bought for the job) marked in yellow. It’s also helpful to disconnect the thin vacuum pipe heading to the EGR valve (the circular thing at the bottom of the picture). With the plastic housing loose, you should be able to see where the leak off pipes attach to the head (I’ve marked the places in red). If you follow the pipe it goes down to the fuel pump (to the right of the dipstick). Now, it’s just a case of removing the pipe in the 4 places it goes into the head, and where it goes down to the fuel pump, I had to use some mole grips to get the two middle pipes off as there isn’t much to hold onto them with! Hopefully when you’re done, you’ll have a rather sad and rotten looking set of pipes. Don’t bin this just yet, you can use it as a template for your new hose. You could reuse the connectors, but personally, it’s best to replace them as they can fail in time. 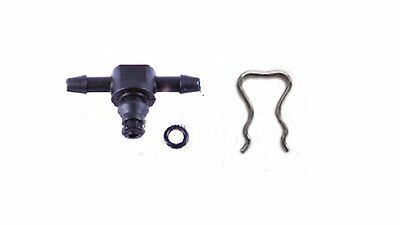 Now – you can get replacement pipe and connectors from Vauxhall – the part numbers are 93181131 for the hose and 9281478 for one connector. Or – you can get them elsewhere – I got the hose from Amazon and the connectors from eBay . Trim the pipe to match the old one – perhaps give yourself a little extra, but not too much. Then put it all together in a similar fashion to the old one like so.. They push on relatively easily, and they do go on quite a way, so make sure they are as far as they can go. Put everything back together again, don’t forget if you disconnected the EGR, put the vacuum pipe back on (I forgot!). You should hopefully be good to go, fire up the engine, it should start first time – if it doesn’t turn the engine over for 15 seconds, wait a bit and try again. Hopefully your replacement hose will last you another 80,000 miles or so! UPDATED – Why I like Richer Sounds..
No worries – eBay deletes old items – these are the connectors – http://www.ebay.co.uk/itm/VAUXHALL-ASTRA-H-1-7-CDTI-INJECTOR-RETURN-LEAK-OFF-T-PIECE-PIPE-DENSO-2007-/152253604784?hash=item237305a3b0:g:XQYAAOSw8w1X5q2n (I think!!) – It’s been a few years since I did this! 🙂 Good luck! The link claims that they won’t fit a Zafira A but I get the point and now know what I’m looking for. Thanks again for the help!